Image: America #1 interior art by Joe Quinones, Joe and Paolo Rivera, and José Villarrubia. When you’ve helped lead the Young Avengers, or when you’ve lead a cosmic supergroup like the Ultimates, where do you go next? 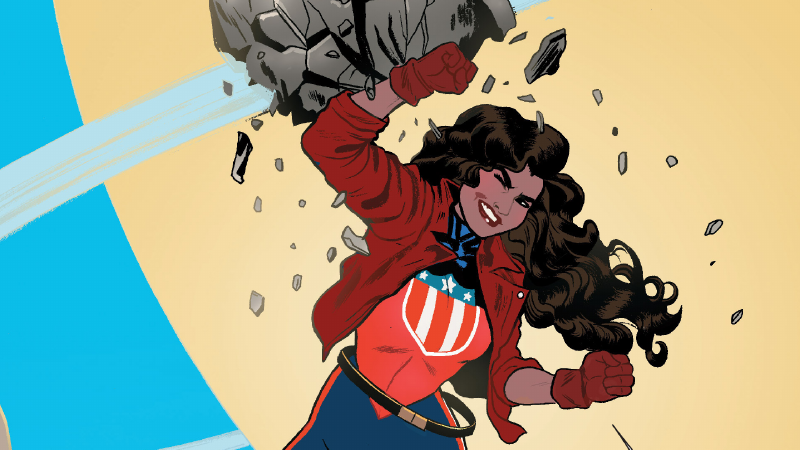 The answer for America Chavez lies in the last place you’d least expect the portal-punching hero to go: college. Just because America’s hitting the books doesn’t mean she can’t hit a few other people, though. America #1—by Gabby Rivera, Joe Quinones, Joe and Paolo Rivera, José Villarrubia, and Travis Lanham—puts America Chavez in situation we’ve not really seen her before: a place where, as the leader of the Ultimates, she pretty much has everything she wants in life, but she’s still craving the need for a new challenge to better herself with. So when you save far off planets in the cosmos day in, day out for a living, and can punch star-shaped holes into the fabric of reality, what represents a challenge? The mundanity of education. Except, America’s path to schooling isn’t quite as humdrum as something we might go through: she chooses to enroll in Sotomayor University, an establishment that’s just as comfortable teaching lessons about intergalactic history as it is the humanities, where aliens, mutants, and powered beings of all sorts can thrive. It presents her with the same kind of challenges any one of us have experienced throughout our time in school: being late for classes, harsh teachers, and mounds of homework. Except in America’s case, being late for class (specifically, late for “Intergalactic Revolutionaries and You”) at Sotomayor U means you nearly get killed by a holographic historical figure, harsh teachers like Professor Douglas stop you from using your superpowers in practical demonstrations, and homework can involve simulations that can send you to the nearest infirmary. So while it’s a totally new environment for the former Young Avenger, it turns out the school life will still be filled with punching and superheroics for Miss Chavez. And familiar faces, as her former teammate David Alleyne—better known by his codename Prodigy—is also on the same class, and tasks himself with helping America get on track and make a project (a historical hologram scenario of a famous revolutionary figure) that will prove herself to Professor Douglas. Unfortunately, America’s headstrong, punch-star-shaped-holes-first-ask-questions-later personality means that when she gets her hands on Prodigy’s high-tech lab setup at the school, she inadvertently sends herself back in time. Yup. Sometimes, you just have to punch Hitler. I can’t wait to see where America takes its titular hero next... or who she’ll get to knock out across time and space, frankly. It’s gonna be great.